Of the 23 total hours I spent in Craig Douglas’s Extreme Close Quarters Concepts (ECQC) course, from 6pm Friday through 6pm Sunday, only 6 were spent on the gun range. Although not easy, the shooting was the easiest part of the course for me. The ShivWorks collective includes “the firearms skills of a USPSA grand master” as one of its ultimate learning outcomes, but Douglas does not teach marksmanship fundamentals – stance, grip, sight alignment and sight picture, trigger press, recoil management — in ECQC. After running us through some simple diagnostic shooting drills he simply observes, “If you can’t get 10 rounds in the 3 inch circle at 4 yards under no pressure you may need some remedial marksmanship practice.” Although he wasn’t looking at my target when he said this, he could have been thinking of my 70% accuracy here. In ECQC, the draw and presentation are considered combative actions. The point is not simply to get the gun out of the holster and presented at full extension with sights on the target as quickly as possible. Rather, the draw and presentation are adapted to the possibility of entangled fighting where shooting from the ideal extended position is not always possible or even desirable. This means being able to draw to and shoot from a strong retention position, and to be able to shoot accurately from what I would call the high compressed ready position, as well as during horizontal extension to full presentation and while retracting from there to high compressed ready. Saturday morning was dedicated to learning about and practicing the draw both to retention and to extension, and firing consistently from various positions, including retention, at high mid-chest when we only have a visual reference on the gun, and during the horizontal range of presentation. We conclude the morning by putting these pieces together in a single drill. We begin with our heads touching the target, draw and fire a one round from retention, then step back/fire again from retention, step back/fire from high center compression, step back/fire from partial extension, and step back/fire from full extension. We do this four times with Douglas issuing the commands (“Draw. Step. Step. Step. Step. Step”) and four times with Douglas just issuing the draw command. Although the shooting was the easiest part of the course for me, it was not at all easy. For example, drawing to high center chest is not that hard. Consistently drawing to high center chest, receiving the gun with your support hand, and having the muzzle straight and flat at compression so rounds fired from there are on target is not quite so easy. Other than drawing and shooting from retention – which I did in an NRA Personal Protection Outside the Home class in the old speed rock style – I had never learned to shoot at different points in the presentation or why I would need to. One of the strengths of Craig Douglas’s ECQC course is the clear integration of the various components in a sort of continuum from words to bodies to guns. We returned to the range again Sunday morning for a “crowded table drill” that reinforces the need to draw the gun from the holster to a high presentation to clear obstacles and get a coarse visual reference on the gun with the muzzle straight and flat. The drill also highlighted how in a civilian defensive shooting context, reholstering is not a simple administrative action. You need to get the gun back to high chest with the muzzle straight and rotate the muzzle straight down while keeping the aim inside your shoulders so as not to flag anyone around you. From there we learned and practiced different “fending” positions, specifically two elbow shields. A vertical shield is more defensive and meant to protect the side of the head opposite the gun and a horizontal shield is more aggressive and meant to protect the front of the head particularly when moving into someone. We practiced both of these shields by shooting up against our targets. 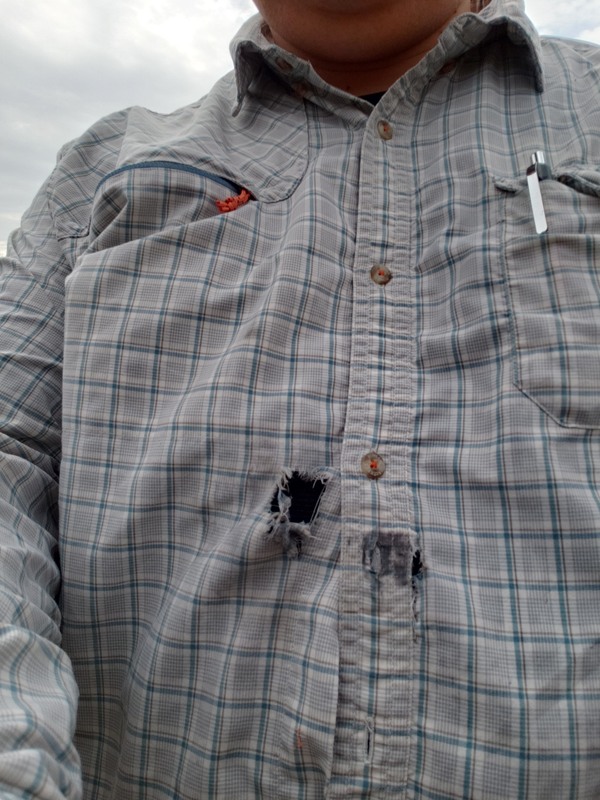 After the drill, I realized that in the horizontal shield position, my favorite Howler Bros. shirt was blousing so much that it hung near the muzzle of the gun and suffered the consequences, twice. ECQC customized Howler Bros. shirt. March 2019. The final two shooting drills for the weekend brought together all of the specific components we learned – the adaptive draw and presentation, shooting at different points in the presentation, moving away from and toward the target, and using the fending positions. First, we drew to retention with the vertical shield and stepped back while firing until we reached full extension. Second, we did the reverse, drawing to extension and moving toward the target shooting to compression and finally shooting from retention with a horizontal shield. Craig Douglas’s ability to break this entangled shooting technique down into its component parts then build it back up into a coherent process allowed me to run these cumulative drills with some success. More importantly, though, I came away from the shooting portion of the ECQC class understanding why it is important for me to continue to practice these processes on my own to solidify my “functional, combative handgun skills at zero to five feet.” It’s not all about stand and deliver. A point that was made even more clear in the grappling and ground fighting portions of the class. Tags: Craig Douglas, Shivworks. Bookmark the permalink. Skimming through this (I admit I’ve not studied the posts), one thing is obvious. CHL training that barely makes sure a concealed carry licence holder knows how to hit a stationary target is pretty inadequate to a real world situation. Hence the old saw, “your concealed carry class is not training” (Tom Gresham). I was just writing about this in the chapter on carry laws in my long-awaited book.